“Imagical Seasons” comes with lots of stunning full-page, full-color photographs, very detailed written instructions that are easy to follow, and unique stitch diagrams that speak the international language of crochet. 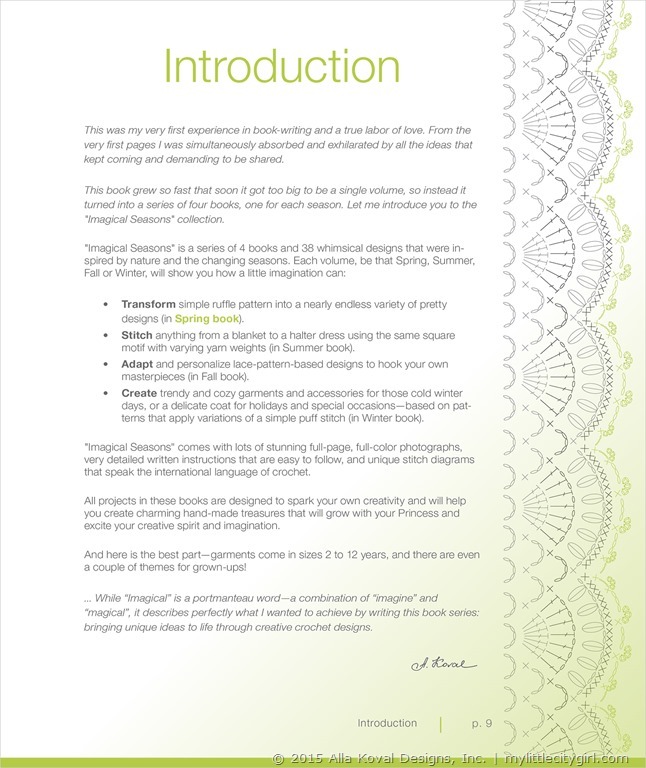 … While “Imagical” is a portmanteau word—a combination of “imagine” and “magical”, it describes perfectly what I wanted to achieve by writing this book series: bringing unique ideas to life through creative crochet designs. Spring and Summer books are coming July, 2015! A lovely and amazing day everyone! OMG! I can’t wait to pre-order these! I have had to take time off from crocheting as the tendonitis in my hand has made it painful to crochet, but I am hoping by the time I get these, it will have cleared up some and I can start up again with these wonderful patterns!